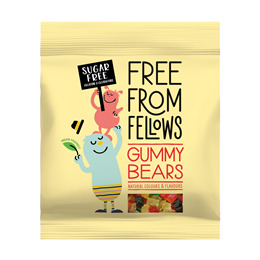 These bear shaped sweets are Free From Fellows` take on an all-time classic. Made without sugar or gelatine, making them suitable for both vegans and vegetarians. Sweetener: maltitol syrup; maize starch, water, acid: citric acid, natural flavourings, vegetable oil (coconut & rapeseed), glazing agent: carnauba wax; colours: lutein, black carrot juice concentrate, spirulina concentrate, safflower extract; sweetener: steviol glycosides. 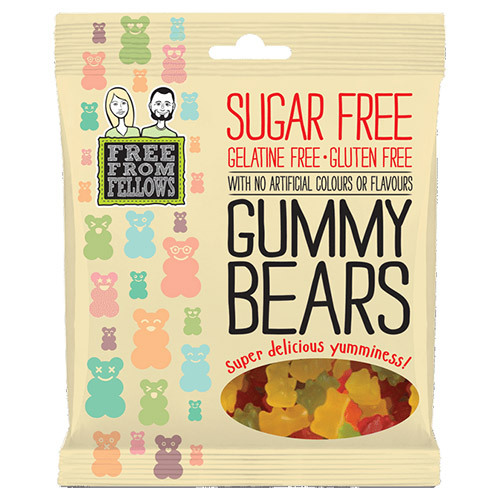 Below are reviews of Free From Fellows Gummy Bears - 100g by bodykind customers. If you have tried this product we'd love to hear what you think so please leave a review. I am trying to move towards a more plant based diet, and in my quest to find vegan sweets I came across these. They are delicious, sweet and really hit the spot when you want something sweet. They were so nice that I ate them all in one go though! I am excited to try some other products from the range.